Leatherwood Uni Dial 4-16x50mm 30mm Main Tube Rifle Scopes have been designed to solve the problem. The ATR Uni-Dial Series from Leatherwood allows a shooter to set the elevation turret to 10 different distances. This will allow for faster and more accurate follow-up shots at varying distances due to the preset dials at the 10 distances of your choice. These Leatherwood Riflescopes have all improved with a wider range of variable magnification. The Leather Wood Uni-Dial A.T.R. 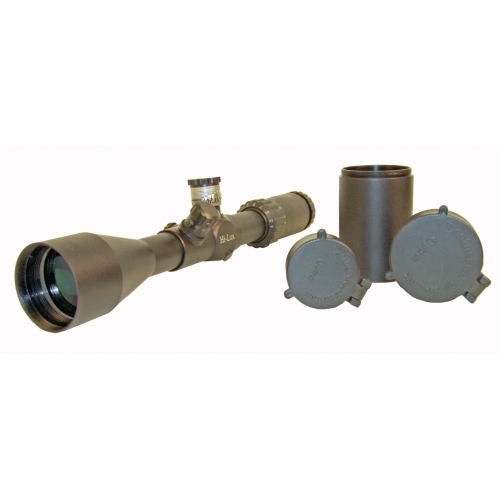 4x-16x 50mm Top-Angle Riflescope features the handy Top-Angle focus along with the capability for shooters to choose the distance on the elevation turret. The UniDial 4-16x50mm Riflescope comes with enlarged erector / turret housing to make these the brightest 1" diameter rifle scopes available today. Leatherwood 4-16x50mm Uni-Dial Rifle Scopes also include an extended sunshade.